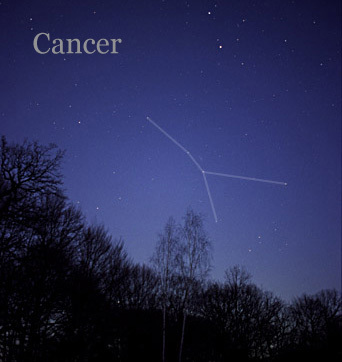 Cancer is a negative, cardinal, water sign ruled by the Moon. The first thing you will usually notice about Cancers is their willingness to help. Ruled by the Moon that reflects the Sun’s light, they don’t have to be in the center of events at all times, although their cardinal nature would cause them to jump and take command if it seems that it is needed. As other water signs, Cancers can tune in easily to feel other people’s pain, and being a cardinal sign, they are usually able to see practical solutions to how to get over the pain. The lesson for them is not to offer those solutions before being asked to provide them. The Moon, when it shines, is the strongest light of the night, and similarly, Cancers excel at “shining light” where others may be content to live with the darkness. This makes them very good researchers, and if they have developed the necessary patience, they are also good teachers and instructors. The Moon’s ability to pull the waters of the Earth can be seen in Cancers’ ability to throw you off balance at times and challenge the exact sensitive point you thought was already resolved. In extreme cases, they enjoy manipulating people’s emotions, but normally they do that with little awareness as to what they cause. The important thing to remember if you are in a relationship with a Cancer is that Cancers occasionally need to disappear or exercise their particular way of not being visible for a little time so that they can reappear. The monthly cycle that influences the Moon is an indication of Cancers’ ability to renew themselves quickly and to face things again with a new approach. The crab, which is the symbol of the sign, has two strong claws that are often interpreted as Cancers’ tendency to hold on to things and not let go. This is where we see their strong loyalties that can last forever and continue to hold through many changes. Many types of crabs live on the shoreline between the water and the dry land, which gives us another clue to Cancers’ ability to move with ease between the worlds and to function easily in both.